The Republic of Equatorial Guinea is comprised of a continental region between Cameroon and Gabon and several volcanic islands including the Island of Bioko where the capital of Malabo is situated, Corisco, Elobey Chico, Elobey Grande, Annobon and Mbañe. Equatorial Guinea has developed into one of the fastest growing economies in the world with a 20% growth in 2006 and a gross domestic product (GDP) of over $25 billion dollars. The population is steadily growing at approximately 2% per year. Schools are open, the country has its first local university and one of the best hospitals in Sub-Saharan Africa. The people of Equatorial Guinea descend from tribal cultures. The Fang, Bubi, Ndowe, Anabonese, Bujeba, and Fernandino tribes occupy Equatorial Guinea’s lands. These people have a history rich in tribal culture and art. Equatorial Guinea is the Amazon of Africa with lush rainforests and incredible biodiversity. 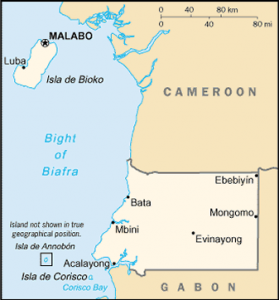 The tropical nation rises from the Atlantic Ocean in the Gulf of Guinea and climbs to over 3,000 meters at Pico Basile. Equatorial Guinea is home to 11 endemic species including primates, butterflies and frogs.